If your dog is licking consistently in one spot and a raw, red, moist sore develops, he or she probably has a ‘hot spot’. 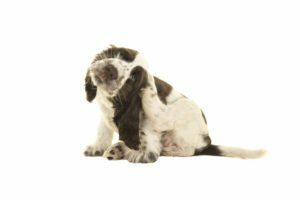 Hot spots (or moist dermatitis) appear spontaneously anywhere on a dog’s body. They are usually caused when broken skin is contaminated by bacteria. Moisture – a recent bath, a swim or even a walk in the rain – will provide enough moisture for the bacteria to multiply. Your dog’s constant licking or scratching will exacerbate its spread. The infection goes into the deep layers of the skin. Tick bites, food allergies and ear infections have all been linked to the development of hot spots. If the hot spot is bigger than 2cm in diameter consult your vet before doing home treatment. Hot spots can flare up quite quickly and spread within hours so it is always better to have them checked out and treated as soon as possible. It is especially important to get your dog to a vet if your dog has a hot spot on a cheek or around the ear. This is often an indication of an underlying ear infection. When treating at home, first trim the fur around the hot spot. If the area is too big, shave it. Exposing it to air will dry out the moisture and help speed healing. Clean the area with a mild water-based astringent or antiseptic spray, or specialised shampoo, and pat dry. Apply hydrocortisone spray or hydrocortisone cream (with a veterinarian’s prescription) to stop the itching and help promote healing. Prevent your dog from biting, licking or scratching the hot spot affected area. Placing a plastic cone around your dog’s neck, for example, can be an excellent tool to keep him/her from biting and licking at it. Keep an eye on the area to make sure it continues to heal and doesn’t worsen or spread. Your vet may prescribe topical medication, and possibly oral antibiotics. The vet may also give your dog a cortisone injection to jump start the healing process. Daily cleaning of the hot spot, even every two hours for the first day or two, will speed up the healing. Once they are no longer oozing, simply keeping the hot spot area clean will be all that’s needed. The fur should begin to grow back within two weeks. Keep your dog well groomed, especially in hot weather. Any dog that has matted, dirty hair coat is at greater risk of developing hot spots. If bathing your dog at home, make sure those areas on his body where the fur is longest, are thoroughly dried. If the fur is allowed to accumulate too much moisture, the wet skin underneath can become the perfect breeding ground for bacterial growth and hot spots. If you’re not confident you can do this properly, take your dog to the Dog Spa for his wash where he will be thoroughly dried with a hair dryer. Ensure your dog is protected year-round against parasites like ticks and fleas. Always feed your dog the best food you can afford. Your vet can advise you on what’s good, and what’s not.